This user manual describes the features and operation of the MX100 "Mini Juke" portable wireless Bluetooth speaker. Please read these instructions carefully before use. Avoid using the speaker near sources of extreme heat including heaters, radiators, stoves, and any open flame. Do not expose the speaker to rain or wet conditions. Do not disassemble, repair, or modify the speaker by yourself. This product contains a Lithium battery! Please discard or recycle according to local laws. To avoid hearing damage, avoid listening to music at high volumes. Ensure the power is turned off when the speaker is not in use. Keep the speakers charged in order to avoid range issues and signal disconnects. 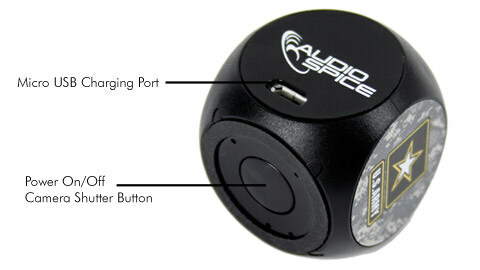 Press and hold the round button for 2 seconds to power the speaker on or off. Single press the button to pause music playback. Press again to resume playback. Please charge the speaker before use. You can use the speaker while it is plugged in and charging. The light will turn RED to indicate charging. When charging is complete, the light will turn off. Turn on the speaker. The flashing blue light indicates when the speaker is ready to be paired to a device. Turn on Bluetooth on your device and search for the speaker. Connect to the speaker. If needed, use password "0000"
The speaker is now paired and ready to stream music! The speaker will automatically reconnect to this device in the future. Power off the speaker before using keyboard function on your device. With the camera application active on your device, press the round button 2 times quickly to take a photo. Use the volume control on your smartphone/tablet to adjust playback volume. Works with mobile devices including iPhone and Android tablets, smartphones, and more. Follow these steps to resolve common problems with your speaker. Check that the speaker is in pairing mode (flashing blue light). If not, restart the speaker. Too many other Bluetooth devices nearby are causing interference. Battery is low; please recharge. Sound is distorted or low. Adjust volume level of the speaker. The battery is low; please recharge. Music playback is not smooth. Move the speaker closer to the device. Not working, cannot turn on. Battery is low and needs charging. Please visit the US Digital Media website for warranty information.